I used four cameras to film Man in the Can: 1 Sony HD camera, 2 GoPros, and 1 Canon G12. Since I was traveling as a one-woman production, I chose cameras that were small, easy to use, and economical. The Sony camera was my main “A” camera. It was light enough so I could hold it over the bucking chutes for long periods of time with one hand, while I used the Canon G12 in the other hand to take still photos. I usually mounted one GoPro to the arena for master shots, and strapped one to a rodeo clown in the arena. I felt it was really important to see the rodeo from the rodeo clown’s point of view. Ronald offered to put me in the barrel during the rodeo so I could film from inside the arena, but the GoPro saved me from getting knocked around by a bull to get the footage I needed. GoPro cameras are great for action shots and getting the perspective of the clowns and bullfighters that most people will never experience. They’re also relatively inexpensive, so I didn’t have to worry about breaking it or someone taking one that was mounted to the arena. GoPro made it possible for one person to be a four camera production. 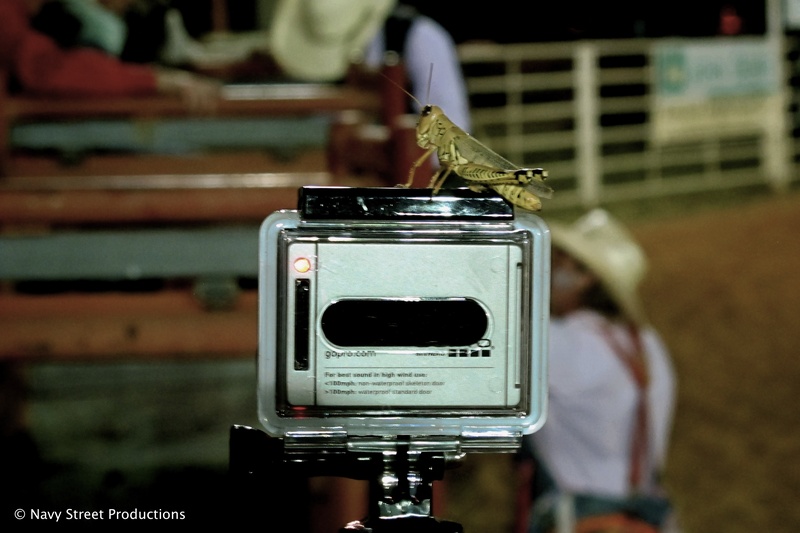 I’m not sure if this photo says more about how small the GoPro camera is, or how big the bugs are in Texas.